In the surreal life that we now live, we find we have lost track of time. We have to remind ourselves that it is Thursday night. The earthquake was at 12.50 pm on Tuesday which means it’s been 2 ½ days since the quake that has ruined Christchurch. You have now seen the images and know some of the stories and that is what its like. In September, if you look back at our blogs, we spent a lot of energy telling the world that the media was blowing everything out of proportion, that Christchurch was ok, that people should still travel to Christchurch. 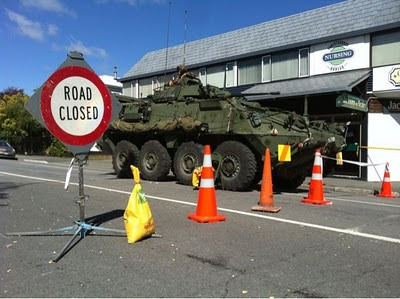 This time it is so different - as you see on the news reports – Christchurch is in ruins and army vehicles patrol the streets. The best thing about Christchurch now is the spirit of the Canterbury people, and with this spirit we are battling through our darkest hour. We are battling with the physical pain of the possibility of losing hundreds of our neighbours, friends and workmates. We are also battling with the uncertainty of what will happen next. After 6 months of enduring aftershock after aftershock, the period between larger jolts had expanded to as much as 7-10 days and we all finally felt that the time had come that life would return to normal. Unfortunately we have been proven wrong and we feel cheated by a mother nature we now find hard to like. And so we started again and are now at day 3. Central Christchurch is cordoned at the 4 aves and there is a 6.30pm to 6.30am curfew. 80% of the city does not have water and 40% do not have electricity and there is no real timetable yet as to how things may return to normal. 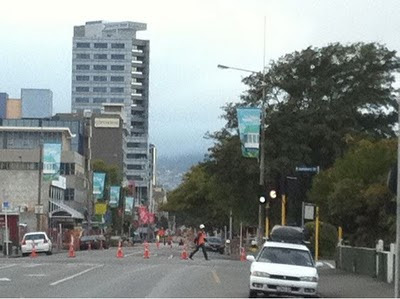 The effects of the quake are so much greater than the 4 Sep quake. That so much damage can be caused in such a short period of time is difficult to comprehend but we are reminded of it wherever we go. Here at the motel we have managed to clean out all the broken plates, cups and glasses from the rooms. We estimate that 98% of these were broken. 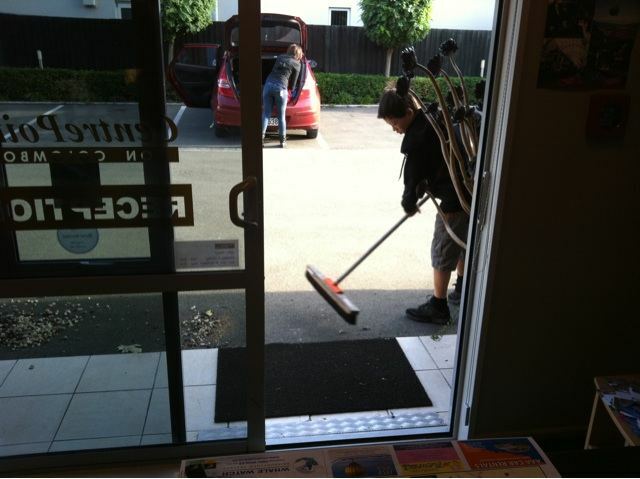 Today Jeff’s sister and brother in law came and gave us a welcome hand tidying up - we look a lot tidier now. Today Tomoki left Christchurch with his Grandma and Grandad, they have headed to Jeff’s sister’s farm in Southland for a rest from the shakes. The 22 Feb. earthquake’s epicentre was under the Port Hills and both they and my sister said that constant aftershocks occurring every 10 minutes or so, made them feel that the hills were constantly moving. Here, we are lucky, only feeling the larger aftershocks. So, where to from here? Today we spent time tidying up and answering phone calls. We have been busy taking cancellations and there have been so many it has taken a lot of time. Jeff has been largely ignoring Twitter and Facebook because there were more pressing issues – a real mess to clean up. We have received an amazing amount of messages and good wishes from people all over the world but at this stage we have not read them. They will be read tomorrow. It lifts our hearts to receive these messages and we thank each and every one of you deeply. 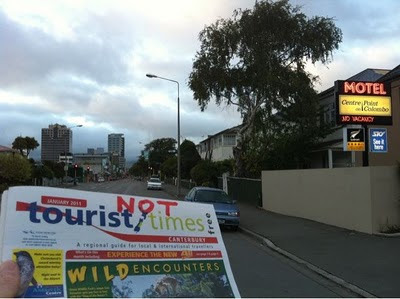 Yesterday and today the motel is full, we are hosting contingents of foreign media from Australia and USA but we are wondering what we will do next week after they have gone – incentives to visit Christchurch are so much fewer now. We will have to put all our efforts into making Christchurch as beautiful as it was so that we will once again be a favourite travel destination. In closing, Jeff would like to express his heartfelt wishes and prayers to the Japanese students still trapped in the CTV building only 10 minutes walk from here. Jeff lived his first 3 years in Japan in Toyama, the Prefecture these kids came from. That something like this could happen on what is meant to have been a trip of a lifetime is very had to comprehend. They are so far from home, it is so unfair.